This is an article to give fact to fiction, and truth to bullying. No where will you find that the Republican Party, or any other sanctioned federal body has ever held in contempt of federal mandates that a person’s ability to vote in secrecy and without prejudice. So please understand that the following is not a want list, but a fact of voting…. The RNC Legal Counsel in 2008, does not recognize the state’s binding of delegates, but considers each delegate to be a free agent who can vote for whomever they consciously, morally, ethically can support. So every delegate can go to the convention knowing that the RNC’s own record shows it does not bully the delegates, and in this year of 2016, it should not start to attempt this practice. In 2012, it was similar to today whereas a lot of the delegates that Mitt Romney needed were bound to Ron Paul, but as everyone is aware, Mitt Romney won the first round, but not through bullying, but through negotiations, honesty, and respect. The vote is to be secret, and delegates should insist that the voting stay secretive, as it is when we vote for political office. Delegates should not fear reprisal from Donald J. Trump, his surrogates, or supporters. This must be passed onto the GOP chairperson, Reince Priebus, and the expectation should be no less than complete safety through a secretive voting for the candidate. 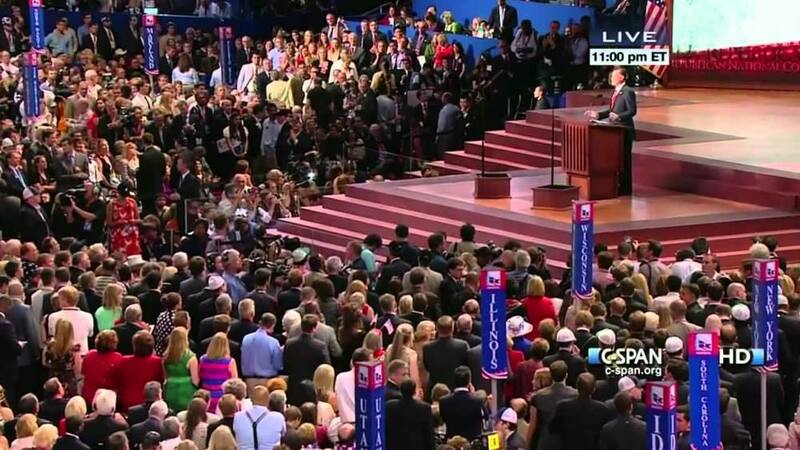 The 2016 Republican National Convention, in which delegates of the United States Republican Party will choose the party’s nominees for President of the United States and Vice President of the United States in the 2016 national election, will be held July 18–21, 2016. The convention is to be held at Quicken Loans Arena in Cleveland, Ohio. This will mark the third time Cleveland has hosted this event, and the first since 1936. In addition to determining the party’s national ticket, the convention will also write the party platform. Several high ranking Republicans have refused a speaking part at this year’s convention due to the railroading affect that Reince Priebus and Donald J. Trump has accumulated over the last few weeks and months. They have tried to scare any strong Conservative from accepting, or trying to be the candidate due to their antics. There are 2,472 delegates to the Republican National Convention, and a candidate needs a simple majority comprising 1,237 or more delegates to win the presidential nomination. There is strong belief that Donald Trump will have more than an insincere reception at the convention by more than 1237 delegates. As Trump rose to become the presumptive presidential nominee of the Republican Party, a number of prominent Republicans announced they would not attend the convention. Of the living former Republican nominees for president, only 1996 nominee Bob Dole announced that he would attend the convention; Mitt Romney, John McCain, George W. Bush, and George H. W. Bush all announced that they would skip the convention. A number of prominent businesses and trade groups, including Coca-Cola, Microsoft, and Hewlett-Packard, have announced plans to scale back participation in the convention, sharply reducing their contributions for convention events and sponsorship. In June, six major companies that sponsored the 2012 Republican convention—Wells Fargo, UPS, Motorola, JPMorgan Chase, Ford, and Walgreens Boots—announced they would not sponsor the 2016 Republican convention. Also in June 2016, Apple Inc. announced it would be withdrawing funding from the convention over Donald Trump’s position on certain election issues. In June 2016, activists Eric O’Keefe and Dane Waters formed a group called Delegates Unbound, which CNN described as “an effort to convince delegates that they have the authority and the ability to vote for whomever they want. Republican delegate Kendal Unruh is leading an effort among other Republican delegates to change the convention rules “to include a ‘conscience clause’ that would allow delegates bound to Trump to vote against him, even on the first ballot at the July convention. Brokered conventions is that they generally occur when there are deep splits inside the Party—splits that can’t be easily papered over. In 1976 the Reagan Republicans waged a fight for the “soul” of the Republican Party. Ditto the Democrats in 1980. Deep splits inside the party are generally also accompanied by a wide-spread belief that the front-runner coming into the convention is weak and almost sure to lose in November. That was certainly true for McGovern in 1972 and for Presidents’ Ford (1976) and Carter (1980)—both of whom lost. So let’s turn to the 2016 conventions. Legally, delegates are not bound on the first ballot until the convention votes to say they are bound. So, for instance, if delegates to the 2016 Republican convention want to be bound to the winner of the primary or caucus in their state they will vote to retain Rule 16 which says they should do exactly that. But if the delegates want to be freed up to vote for someone else they will vote to amend or delete Rule 16. And legally state laws requiring delegates to vote for the presidential candidate who won the state are inferior to party rules and unenforceable. (Will the Arizona state troopers really come to Cleveland to arrest delegates who vote the wrong way?). So the time is now to let all delegates know-there is no rule currently that forces them to vote a specific way. Let the delegates make that decision, and be totally beholden to the laws of the U.S. election laws. Wilson County, Tennessee vs. Private Property RightsSecession Movements Pick Up Steam!